Davenport, Stockport : Who was Winifred? Above: the Bramhall Lane area, circa 1875. Between the Blossoms Inn and the station the traveller along the lane would pass between fields, interrupted only by views of brewer Henry Bell's mansion Heath House (later renamed Heathfield), Ephraim Hallam's 1859-built cotton mill, and cotton waste dealer Samuel Rigby's home, Bramall Mount. All three of these buildings still exist, with different uses, in 2009. Winifred Road has changed little over the years, except that both sides are now lined with parked cars. The main change has been the demise of the shops originally provided. The butcher's shop (above) at No.62 was the last shop to survive, in business until 1994, before being converted to a house. The small building alongside no.62 was perhaps part of its role as a butcher's. Could animals have been slaughtered there? By 1902 the butcher was Thomas Lowe; in 1911 he was a widower living there with his daughter Sarah (39) and his nephew John Alfred Drummond (30) - both 'assisting in the business.' By 1934, John Alfred had taken on the business; by 1965 the butcher was M.Marsh. There were two small grocers in Winfred Road: Signs of conversion from their former use are evident today. No.64, which was run by William Bostock until at least 1934. The shop was still in business in 1965 but seems to have been converted to a house soo afterwards. Stockport-born William Bostock was recorded there in 1911, aged 45, with his wife Frances, three-year-old daughter Phyllis, and niece Satah Thornhill Harter (16) who was working as a felt hat trimmer. No. 89, converted in 1975, has a rendered frontage with modern bay window, and is also conspicuous by its white frontage, a feature which can be seen on many of the 'corner shops' included in rows of houses of the period - no doubt to advertise their existence. 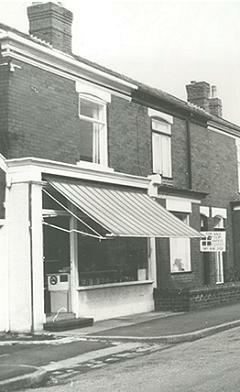 At the east end of the street, No.8 was at various times a confectioner, a greengrocer's shop, and maybe some other business; it was converted to a house in 1988. The houses of Winifred Road were intended for rent to skilled workers, junior clerks, and those of similar incomes. Most of them in 1901 had small families, although one or two houses must have been quite crowded. No. 40, for example, was the home of Alfred G. Bassett, a plumber, his wife and their six sons aged between 8 and 22. At No.22 Winifred Road in 1901 was Alfred James John Sampson, confectioner (born in Cambridgeshire), his wife Mary and their seven children aged between 3 and 16 - the two eldest working as assistants to their father. By 1911, only four children remained at home, and Alfred was no longer an employer, but a worker - confectionery foreman. Perhaps he went to work at the Squirrel Confectionery works which had taken over the former cotton mill nearby, now the industrial estate known as Heaviley Mill. At 80 Winifred Road in 1911 were George and Frances Evans, newly married, George was an electric tram guard, employed by the Borough Council. Their neighbour at 82, William Hughes, was an electric tram driver. In 1905 the council had bought the tramway line from Stockport to Hazel Grove, which ran along Buxton Road past the end of Winifred Road, and converted it from horse to electric power. Street names can have a fascination, but the people who named many of Davenport's streets in the period around 1900 seem to have been concerned with making the place sound leafy and rural, with Heath Crescent, Beech Road, Beechfield Road, Oakfield Road, Ashfield Road, Elmfield .... by contrast, though, the builders of the streets of small houses north of Kennerley Road, in what is strictly part of Heaviley, seem to have had other things on their minds. Winifred Road, Countess Street, and joining them, Abergele Street for example. What's behind these names? Dundonald Street, a little nearer Stockport, is also part of the pattern, because all these street names relate to Winifred, Countess of Dundonald, who lived at Gwrych Castle, near Abergele in North Wales. Winifred Bamford-Hesketh was the only child of Robert Bamford-Hesketh, Lord of the Manor of Cheadle Moseley and owner of much land in our district as well as the Welsh estate. 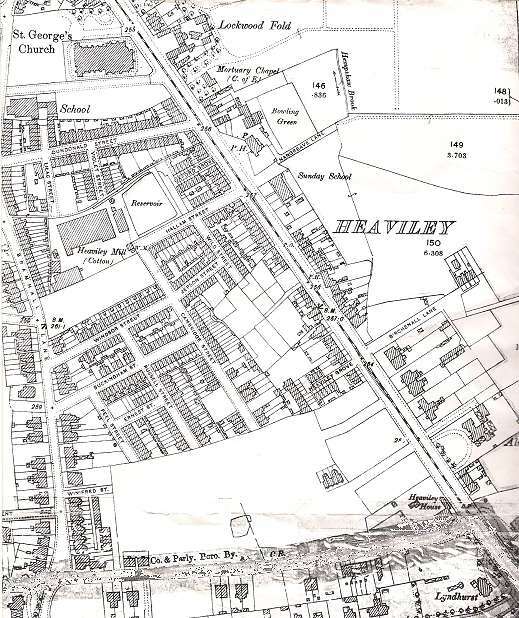 The tithe map above (made around 1850) shows the triangle of roads formed by the Stockport - Buxton main road, Bramhall Lane, and Kennerley Grove Lane, now Kennerley Road. At the time this area was part of the Cale Green ward of Stockport; the boundary with Bramhall township followed Kennerley Grave (or Grove) Lane, which later became Kennerly Grove, and later still Kennerley Road. Ownership of the land in this neighbourhood at that time was something of patchwork, with different owners owning fields of pairs of fields which they or their ancestors bought as investments as they became available, probably sold by the Davenports of Bramhall Hall to raise money. 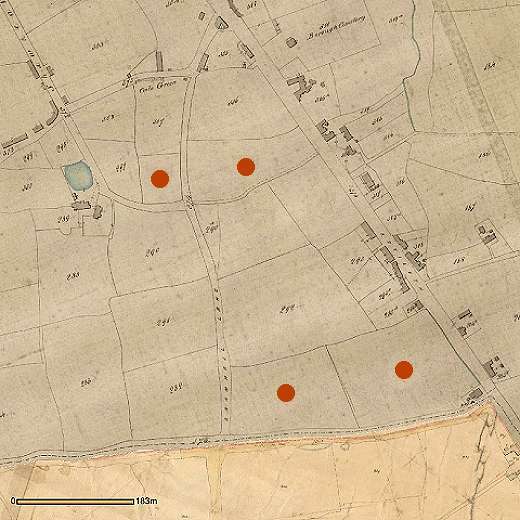 The four marked by red dots on the tithe map above were among those owned in 1850 by Lloyd Hesketh Bamford-Hesketh, and when he died passed with the estate, including Gwrych Castle (and much land in Abergele) to his son Robert Bamford-Hesketh. The estate also included the eponymous Bamford Arms inn. The owners of the adjacent land developed it for building from the 1850s onwards: Ephraim Hallam built his cotton spinning mill around 1860, and houses for his managers on the Bramhall Lane frontage. Some of the adjacent land was used for a small park and a row of almshouses - on Hallam Street - which he presented to the town of Stockport. For what happened to the Hallam land, see our article Ephraim Hallam's legacy. On 18 September 1878 Winifred, aged 19, married Douglas Mackinnon Baillie Cochrane (1852-1935) - in what is said to have been an 'arranged marriage.' Robert Bamford-Hesketh presided over many developments in the Abergele area, until his death in December 1881, when the estate, including the Cheshire holdings, passed to his only child Winifred, who, with her husband, began to develop their land in the Stockport area, where there was a great demand for housing. On the death of his father in 1885, Douglas Cochrane became the 12th Earl of Dundonald, and Winifred Countess of Dundonald. First to be developed were the two fields towards the north of the triangle. 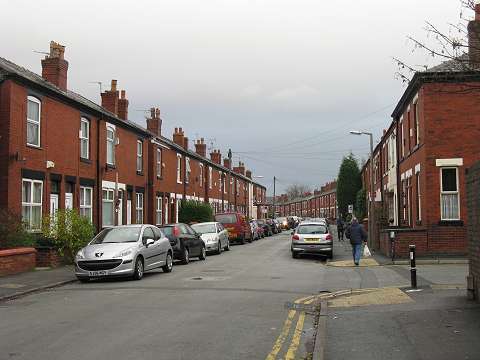 A new street, named Dundonald Street, was laid out, connecting Bramhall Lane with the Buxton Road, with short offshoots named Lilac Street and Violet Street - colours perhaps connected with the Dundonald or Bamford Hesketh family in some way - and Chatswood Avenue. The Cale Green & Heaviley Conservative Club in Dundonald Street (above) - which latterly advertised itself as 'The Dundonald Street Club C.G.H.C.C.' - was built in the 1880s to the a design by James Hunt of Stockport. Also in the street was the Reform Club, based in former houses at nos. 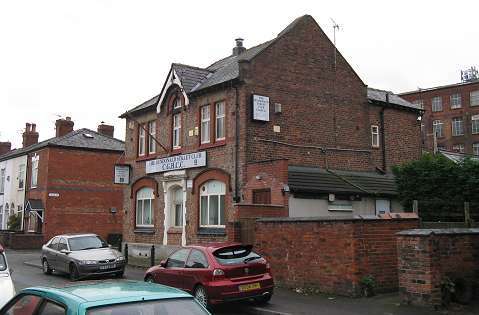 13-19 and, latterly known as the Cale Green Social Club, converted back to houses in the 1990s. The club closed in 2013, and in 2014 the building with its surrounding land was offered for sale for £275,000. Above, an impression from a 2015 planning application to convert the club building to apartments, with a new house alongside. The terrace on the south side of the street carries a plaque 'Jubilee Cottages 1887' which dates them nicely to Queen Victoria's jubilee year. Compare the area in the map below with the shape of the field on the tithe map, and you can see how the shapes of the back gardens follows the original curves. To the north of the Dundonald Street land, St George's Church was built, from 1892-97, followed by the vicarage and schools. This land had been bought by Wakefield Christie (who had already left the area by then) of the hatting family and donated for the creation of the Church. 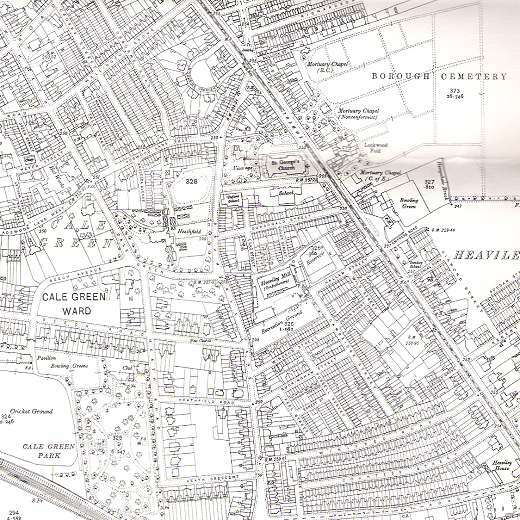 The map above was published in 1898 (the blurry area along Kennerley Road is where someone drew in the boundary of Stockport on the original) and shows the Dundonald Street area completed, the shops along Bramhall Lane in place, and a short street labelled as Winifred Street leading to an area which is clearly just in process of construction. South of the mill, streets of small houses appeared, built by someone who believed in pretentious street names with royal or aristocratic connotations, such as Buckingham Street and Windsor Street, although some of the houses were so small and lacking in facilities that they have since been replaced in slum clearance programmes. 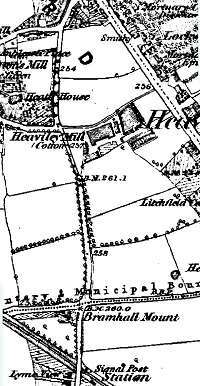 In 1896 the the other two Dundonald fields were leased to William Henry Wild, a builder who lived close by at 77 Beech Road; he laid out streets and built houses, and by 1910, date of this map, the familiar scene of today was largely complete. Following the scheme of family names, perhaps attached as a condition of the lease, the Countess and her home town were commemorated in the two long roads called Winifred Road and Countess Road, and the short cross street called Abergele Street. Above: Winifred Road in 2009, with Abergele Street joining on the right. By the time these three streets appeared on the scene, Stockport had changed to a different style of name sign, still cast iron but with larger lettering than those found in older parts of the town. The Dundonalds owned large tracts of land in other nearby townships: Dundonald Roads can be found in Cheadle Hulme and off School Lane in Didsbury, in the latter case accompanied by a Countess Road and a Winifred Road. 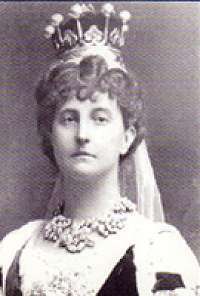 Winifred, Countess of Dundonald, died in 1924, leaving the castle in her will not to her husband but to King George V, and the then Prince of Wales (who later became King Edward VIII). However, the gift was refused and the castle passed to the Venerable Order of Saint John. In 1928, the widower Earl of Dundonald re-purchased the castle for £78,000, selling the contents to meet the cost. 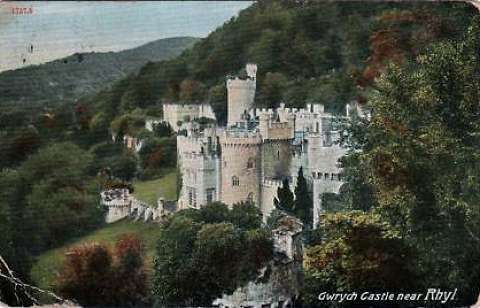 He died in 1935 and the castle passed to his son, the 13th Earl. During World War II, the was requisitioned by the Government and housed 200 Jewish refugees, and in 1946 it was sold, passing over the years to a series of private owners. It was open to the public, with attractions such as bars and restaurants, from 1948 until 1985. In 1989 it was bought by an American businessman, who allowed it to fall into a derelict state, in which it stands in 2012, despite attempts at rescue, and a restoration campaign led by Mark Baker, who was a teenager when the campaign began in the 1990s. Written by Charlie Hulme, 2009. Laat updated November 2015.